Roeland luyten (Leuven, Belgium, 1977). As a young boy, fascinated by science-fiction and horror movies, he undertakes his first contacts with electroacoustic sounds. At the age of 8 he went to the music academy in Louvain to study music theory and flute. During high school, he learned to play electric guitar and effects pedals by playing in a music band with his friends. After high school he continued having interest in music which made him decide to study classical music and flute at the Royal Conservatory of Antwerp. 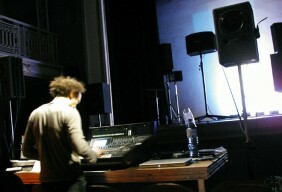 There he found his real passion in the studio for composition of electroacoustic music under guidance of Joris de Laet. Since then Roeland works as a composer and sound engineer along with various theatre and dans productions in collaboration with choreographers in Belgium and abroad. His music has been played and has recieved prizes throughout the world.